I’m 42 years old with two son’s aged 24 and 13. Since becoming a mum at 17, I devoted my life to my children and forgot that I needed time for me and stopped doing everything I enjoyed. On top of my inactivity I was also diagnosed with an under active thyroid. This means my metabolism is very slow and my weight steadily grew to 16 stone (well that’s when I stopped weighing myself). I then had an accident and damaged my pelvis and the pain I suffer everyday stopped me from exercising (or so I thought it did). In 2015 I decided I needed to change my life as I was not happy or healthy. With all of my ailments mentioned above, in addition to arthritis, hypermobility, dehydrated spinal discs and a prolapsed disc in my neck I decided that nothing was going to stop me. I was in pain everyday anyway so I might as well be in pain but getting fit, so there it began. Over the past couple of years I have transformed my life, lost 7 stone and I am the fittest I have ever been. I love my new body and the energy I have. Now I want to help inspire others to make positive changes in their lives. 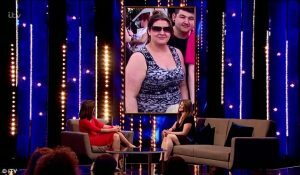 Last year I appeared on Davina Mc’Call’s This Time Next Year where I pledged to have a tummy tuck to remove the excess skin from my tummy and compete in a bodybuilding competition for the first time. I’m happy to say that I successfully achieved my pledge. 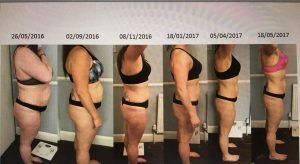 Last year I qualified as a PT so that I could really help people to transform their lives so that they can be healthy and happy. I now have the privilege of working with Simply Gym which is an amazing facility where my clients can really achieve their goals.